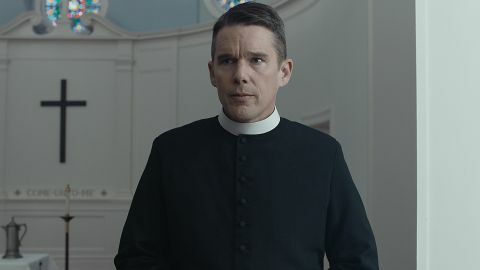 First Reformed review: "A volatile mix of gravitas and grindhouse"
Paul Schrader’s best for 20 years. A stunning study of one man’s flaws and an apocalyptic vision of mankind’s fate. Situated in the fictional town of Snowbridge in upstate New York, the First Reformed Church is a white clapboard box with its steeple jabbing accusatorially at the grey, possibly empty heavens. It is presided over by Reverend Ernst Toller (Ethan Hawke), a former military chaplain whose sparse life is one of genuflection and reflection, scratching nightly entries into his journal and trying to raise funds to fix the organ in time for the church’s reconsecration in this, its 250th year. Soaked in guilt and whiskey, Toller is pained in mind, body and spirit, unable to forgive himself for advising his son to enlist in the Iraq War – he died in combat – and bent double by stomach pains that are likely cancer. And yet the burdens on his psyche and soul are set to increase: pregnant parishioner Mary (Amanda Seyfried) asks him to counsel her husband Michael (Philip Ettinger), an environmental activist distraught at the desecration of Mother Earth. So much so, in fact, that he wants his wife to terminate the pregnancy and save the child from hell on Earth. Meanwhile, Edward Balq (Michael Gaston), the billionaire industrialist who is funding the church’s reconsecration, is poisoning the environment, and Toller feels increasingly unable to turn a blind eye to this unholy communion between religion and the American right. It’s been 21 years since writer/director Paul Schrader’s last masterwork, the Oscar-winning Affliction. Since then, he’s struggled to hit the ecstatic highs of his early screenplays (Taxi Driver, Raging Bull, The Last Temptation of Christ) and best directorial efforts (Blue Collar, American Gigolo, Mishima: A Life in Four Chapters). But now Schrader’s back with a belter. Initially sincere and austere, First Reformed’s contemplative drama is lent considerable weight by DoP Alexander Dynan’s static, stately compositions painted in chocolate-rich tones. A solemn and muted picture, it recalls such Euro-arthouse behemoths of the ’50s and ’60s as Ingmar Bergman’s Faith Trilogy and Carl Theodor Dreyer’s Ordet. The most obvious comparison, though, is Robert Bresson’s Diary of a Country Priest, another tale of a preacher who etches his turmoil onto parchment and struggles to fulfil his duties while crippled by a stomach ailment. If that all sounds off-puttingly rarefied, then consider that Diary of a Country Priest was a touchstone for Taxi Driver. What’s more, Toller – superbly played by a pinched, slope-shouldered Hawke – is, like Travis Bickle, another of God’s lonely men. Hell, he even plonks Pepto-Bismol into his whiskey to soothe his roiling guts, an action surely meant to evoke disturbing memories of Travis gazing blankly at the Alka-Seltzer that so famously fizzed in his glass. Like Taxi Driver, First Reformed is a volatile mix of gravitas and grindhouse, its oppression turning to rage and madness. Stop the film two-thirds of the way in and you’d never believe the images to come, as lust and violence, levitation(!) and transcendence take over and the film veers into the realms of exploitation cinema. This is the Schrader of Cat People, The Canyons and his last two movies Dying of the Light and, especially, Dog Eat Dog – the Schrader who is showman as much as cineaste, who prays to the serene stylings of Yasujirô Ozu (Tokyo Story) but equally kneels at the altar of pulp. Come the indelible finale, the camera, like the characters’ emotions, has cut loose to swirl giddily. "This is galvanising moviemaking that burns with pain and anger"
Only a tyro filmmaker possessing the exuberance and arrogance of youth or a master filmmaker in the twilight of his career, working outside of the studio system and free to do as he pleases, could make such a movie. Not all viewers will take the leap of faith required to follow Schrader as he casts off his stripped-back aesthetic for such heated imagery. But this is galvanising moviemaking, suggesting the 71-year-old auteur hasn’t mellowed with age. It’s a picture that burns with pain, desire and anger – the rage directed both outwards and inwards. And far from being simply Taxi Driver 2.0 (or 3.0, given Schrader wrote Scorsese’s soul-sick paramedic drama Bringing Out the Dead), it is the summation of a career. Here, old bottles are filled with new variations on trusty themes; the full-bodied flavours of environmentalism, terrorism and America’s twin building blocks of Christianity and capitalism uncorked and rolled around the mouth before being spat out. It’s a film worthy of worship.